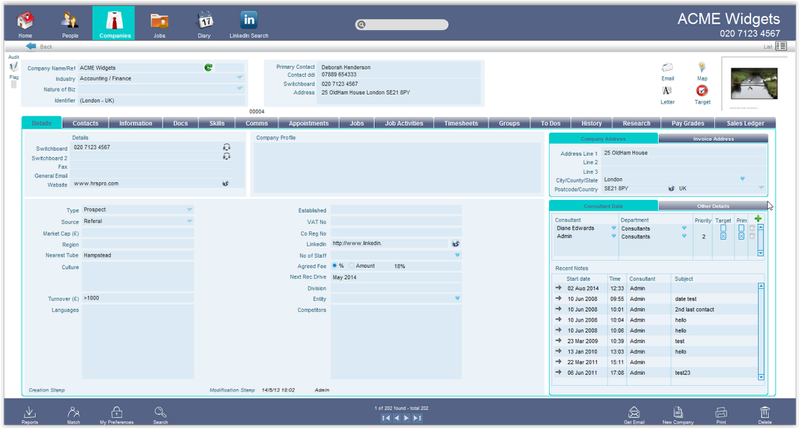 Companies - List View contains Companies by Unique ID, Company Name, Distance (from searched postcode), Switchboard phone number, Identifier, Main Contact, Industry, Nature of Business, and Exclusion from Mail Merges. You can sort the list by any field displayed in List View. Form view always contains the company name, industry type, primary contact, telephone and address information for the company at the top. This tab contains contact details, company information and address information. This tab contains company profile, invoice details and any other additional information.